Cell phones and motorists are a bad mix. 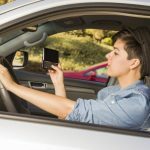 The split second it takes to answer the phone is enough time to get into a serious accident, and as if that’s not bad enough, most California motorists pay more attention to the person their speaking to than they do driving their car. In an attempt to keep motorists’ minds on their driving, California lawmakers have passed several laws designed to curtail the use of cell phones on the road. Most motorists know about the laws the prohibit picking up the phone and holding it while driving as well as the laws that state they can’t text while they’re driving. Fewer are aware of the fact that any driver under the age of 18 is prohibited from using even hands-free devices and speaker phone while they’re behind the wheel. Based on statistics that show that even drivers who use a hands-free device while on the phone are at an increased risk for getting into a serious accident, it’s likely that a day will come when even drivers over 18 will be penalized for using the devices while driving. California’s patrol officers are constantly looking for drivers who are breaking the rules and talking on the cell phone. Even the faintest hint that you’re phoning while driving and they will pull you over. Do to the severity of the accidents that have happened as a direct result of cell phone use, most aren’t sympathetic and won’t let you go with a warning. The first time an officer catches you using a cell phone while driving, you’ll get hit with a $20 ticket. After that, the cost goes up to $50. And that’s just the tip of the iceberg. 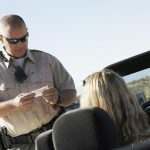 If you were doing things like speeding, weaving, or not obeying traffic signs while you were talking, those will be added to the ticket, driving up the amount the state collects from you. Most people who are pulled over for using their cell phone while they’re behind the wheel, ultimately pay $250 in traffic fines. In addition to the cost of the ticket, most insurance companies raise the rates of drivers who are ticketed for cell phone use. The best way to stay out of trouble and avoid costly fines while also reducing the risk of you getting into an accident is pulling over to the side of the road if you need to make a call.